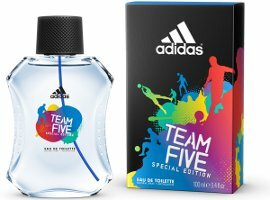 Adidas has launched Team Five Special Edition, a new fragrance for men inspired by 5-a-side football (soccer). Team Five is fronted by Zinedine Zidane. The notes include basil, green apple, lemon, sage, lavender, peppermint, pine, amber and benzoin. Adidas Team Five is available in 50 and 100 ml Eau de Toilette and in a variety of matching grooming products. Definitely targeting the Peter Pan set with that bottle and box. My 9 year old would ask if it came with Legos.